"On Friday night artist Shephard Fairey was arrested by Boston police in connection with his efforts posting his art in various areas around the city. He was released a few hours later. Because of the arrest, he was unable to attend last night's sold-out "Experiment" event at the ICA where he was scheduled to DJ. Shepard Fairey has spent the last two weeks in Boston installing his first ever solo museum exhibition, giving sold-out public talks, being honored by the Rhode Island School of Design, creating and unveiling outdoor artworks, including a 20-foot by 50-foot banner, on the north side of City Hall, and two murals on Tufts University campus grounds. We believe Shepard Fairey has made an important contribution in the history of art and to popular thinking about art and its role in society. We are enthusiastic to be working with him and are pleased to be showing the first museum retrospective of his work. 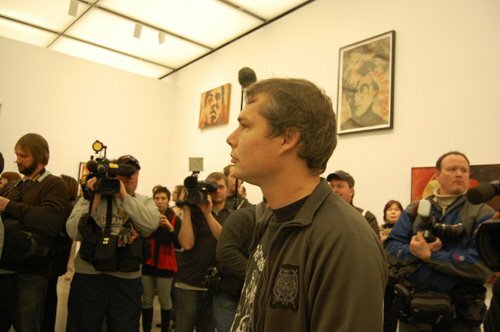 The exhibition, Shepard Fairey: Supply and Demand, is a 20-year survey of his art. It includes more than 200 works and is now open to the public and will be on view through August 16." LA street artist Shepard Fairey was arrested on two outstanding Massachusetts warrants around 9:15 last night as he was about to enter the ICA to dj a sold-out dance event there, according to news reports. Fairey was arrested on two warrants issued on Jan. 24, 2009, one from Brighton District Court and one from Roxbury District Court, Boston Police spokesman James Kenneally tells me. They charge him with damage to property by graffiti in two locations: (1) Massachusetts Avenue and Newbury Street and (2) a railroad trestle by the BU bridge (this seems to be an Andre the Giant poster on a bridge over the Charles River). Kenneally said Fairey would probably be held until arraigned Monday. One charming tactic police often use is to arrest people after courts close on Friday, to complicate the process of getting them bailed out and sometimes requiring them to wait all weekend in jail before they can be arraigned on the next business day. Jake Wark, press secretary for the Suffolk County District Attorney, said arraignments would likely take place at both the Brighton and Roxbury courts. I'm hearing that Fairey was bailed out around 3 this morning, but I've not been able to confirm this yet. ICA statement on Fairey's arrest. The museum confirms that Fairey was "released a few hours" after police took him into custody. 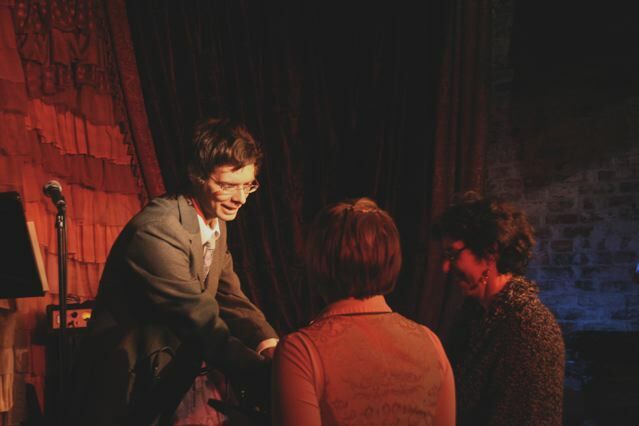 Photo by The New England Journal of Aesthetic Research at the ICA press preview on Feb. 3, 2009. Why do they hate us – and zoo babies? The amendment was backed by Republican Sen. Tom Coburn of Oklahoma. Look again at that margin. Wow, they hate us. And the hatred is bi-partisan. I should note that New England senators didn’t support this exclusion, except for Maine’s two Republican senators, Susan Collins and Olympia Snow. Now one can understand senators hating on the arts because we’re a bunch of lazy layabouts, producing no work and no jobs, paying no taxes, nothing. Not like those role-model bankers the government keeps bailing out. But how can 73 Senators come out against casinos? And community parks? And zoos? If we don’t support zoo jobs in this time of international economic calamity, who is going to take care of the babies? 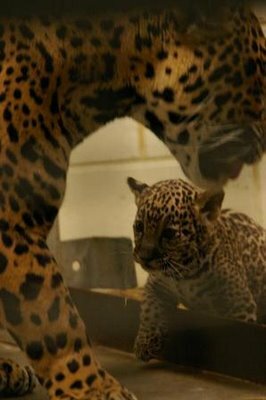 Like the jaguar (pictured at top) born at Boston’s Franklin Park Zoo last May 31? Or the patriotic wildebeest baby born there last July 4? Why do Senators Collins and Snow hate cute, cute zoo babies? Will defunct Rose replace defunct Safra Center plan? Why do Brandeis’s plans for its Rose Art Museum sound so much like its plans to construct a new art center on campus that were cancelled last fall? Brandeis announced in 2004 that it had received a $10 million pledge from the Edmond J. Safra Philanthropic Foundation to help build a new art center. The foundation is lead by the late banker’s widow, Lily Safra, a grandmother of students who graduated from Brandeis in 2004 and ’06. She was ranked 746 on Forbes’s list of the world’s billionaires in 2006, with $1 billion. 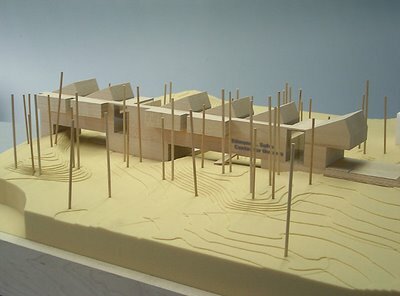 Renowned architect Moshe Safdie was hired to make designs (his preliminary models are pictured here). The 22,500-square-foot, three-story Edmond J. Safra Center for the Arts was to be erected right next to the school’s Rose Art Museum and include a gallery, student art studios, critique space, a lecture hall and seminar room. In September 2004, Brandeis executive vice president and chief operating officer Peter French reported that construction was expected to run from mid-2006 to fall 2007. But in May 2007, French reported (pdf) that construction was expected to run from early 2008 to fall 2009. By last March, construction was delayed again, university officials said, because of ballooning projected costs. But work was still expected to begin late in fall 2008 and be finished by late 2009, according to a university update dated Aug. 21, 2008. So when Brandeis leaders talk of converting the university’s Rose Art Museum into a “fine arts teaching center with studio space and an exhibition gallery” people can’t help thinking that the plan sounds oddly familiar. Is Reinharz sacrificing the Rose to make the Safra Center come true? I’ve pasted in the entire e-mail below. Reinharz has been backpedaling for a week now. But I'm not sure how much this announcement actually changes things on the ground. I don’t think Brandeis leaders ever said they were going to sell all the art right away. This implies that now they'll probably only sell some of the collection. But it doesn't actually take selling all the collection off the table. There are doubts that they could sell all the collection anyway. It includes lots of minor works. They were probably always -- and still -- focused on selling the greatest hits. Reinharz compares himself to Obama, saying “To quote President Obama, ‘I screwed up.’” This is outright offensive – besides being an inaccurate analogy. It's not like Obama admitted screwing up when he announced plans to close all the national parks and sell them off. He said he screwed up because he proposed one bum personnel appointment. Reinharz comparing himself to Obama feels more like Blagojevich comparing himself to Gandhi. It just confirms that he's a schmuck. vote by the Board of Trustees concerning the Rose Art Museum. of these matters. To quote President Obama, "I screwed up." The Norman Rockwell Museum announced yesterday its formation of a new center for the study and sharing of illustration art. The announcement was delivered at an event marking the Stockbridge, Massachusetts, institution’s 40th anniversary year and Norman Rockwell's 115th birthday. The event also included the launch of the public phase of the museum’s $25 million fund-raising campaign. The Rockwell Center for American Visual Studies aims to bring greater scholarly attention to the art of illustration. The center’s launch is funded by a $150,000 pilot grant from the Institute of Museum and Library Services, according to the museum. Joyce K. Schiller (pictured below), an expert on American illustration art who serves as curator of American art at the Delaware Art Museum, has been appointed the center’s first curator. She is expected to begin work in May. Shiller tells me that she has long found that illustration is an area largely untouched by scholarship, and hopes to foster for the field the sort of serious scholarly attention that fine art routinely gets. She says she’s impressed by the leadership of the Rockwell Museum – in particular Director Laurie Norton Moffatt’s support for scholarship about Rockwell, regardless of whether individual scholars are admirers of Rockwell or not. “The discussion is more important than everybody agreeing,” Schiller notes. Schiller’s current job covers (primarily) American art from the 18th century to now. She has a specialty in illustration from the mid 19th century to the 1930s. The Rockwell Center for American Visual Studies is expected to provide online access to the museum’s entire collection and Rockwell’s catalogue raisonne; to build an online network of information about and collections of illustration art; to fund scholarly research into illustration art; and build an illustration art collection at the Rockwell Museum to contextualize the museum’s Rockwell collection. The museum has already assembled more than 80 works for its new illustration collection. The center will host “ProjectNorman,” a 10-year-long project begun in 2003 to digitize the museum’s collection and put all of it online. 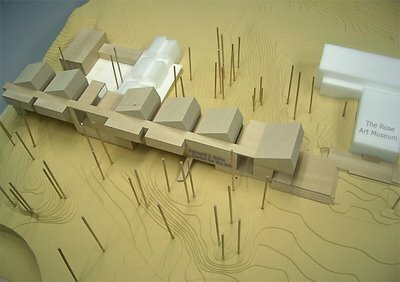 The project’s website is scheduled to go live in November 2009. The initial offerings will primarily present 40,000 of Rockwell’s reference photos, amounting to about a quarter of the museum’s collection. The project has received $1.5 million in funding from various foundations and federal agencies, the museum says. The museum announced the public phase of its “Sharing Rockwell’s Legacy” fund-raising campaign, which has brought in $18 total donations and pledges since it was quietly launched in 2006, the museum reported. Art (gifts and pledges) account for $10 of that total. It is a comprehensive campaign to fund the center, ProjectNorman, education programming, operations, collection care, and the museum’s endowment. The museum aims to raise $25 million. 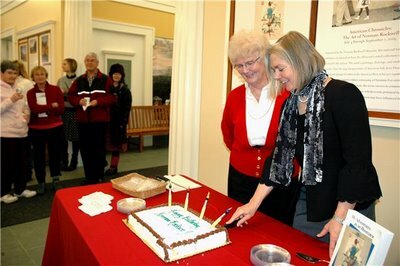 Pictured from top to bottom: 1: Norman Rockwell Museum Director and CEO Laurie Norton Moffatt and Ann Barrett (Norman Rockwell's former secretary) cut a special birthday cake honoring Norman Rockwell's 115th birthday on February 3, 2009. 2: Joyce Schiller. Photos courtesy of Norman Rockwell Museum. 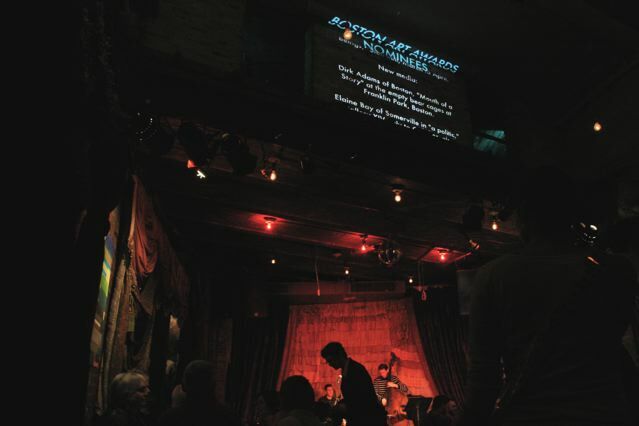 Here is the 2008 Boston Art Awards Ball at the Beehive last night as photographed for The New England Journal of Aesthetic Research by the marvelous Jane Cunningham. 1. Master of ceremonies Greg Cook of The New England Journal of Aesthetic Research and The Boston Phoenix. 2. Cook presents Judy Haberl the critics’ pick award for photography. 5. Jane Marsching of Platform2 comes up to receive the critics’ pick award for public exposure for the collective’s “Parade for the Future.” Behind her Rebecca Siemering of Providence Art Windows arrives to receive the people’s choice award in the same category. 7. Emily Isenberg, Michael Brodeur of the Phoenix, and Evan Garza of the Center for Latino Art and the Phoenix. 8. 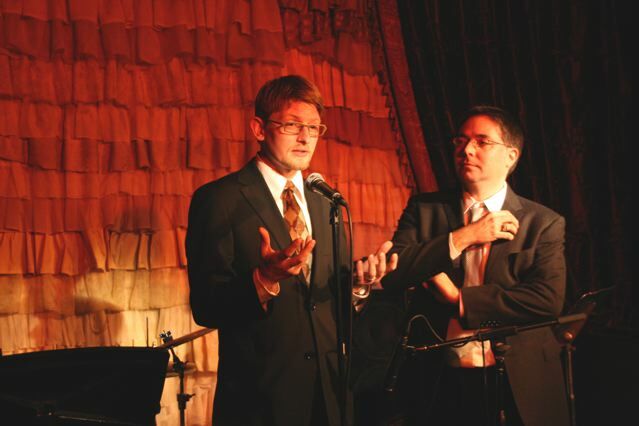 Big Red & Shiny’s Matt Nash and James Nadeau, who helped organize the party (thanks Redheads). 9. Cook presents the critics’ pick award for locally-curated historical show to Samuel Scott for curating “To the Ends of the Earth” at the Peabody Essex Museum. We live in a wired world, where much has become decentralized, and many hurdles to participation have been lowered. The Boston Art Awards, an open-to-all project organized by a local blog, marks a great moment for the place of our alternative wired press – and the web in general – in our art community. Still the art world remains focused on the closed Circuit of Away biennials and art fairs and New York. But with the money that is the lifeblood of this Circuit evaporating, perhaps now is the time for the art world to have a webby decentralized moment too. It’s the moment for folks like us in the provinces – the yokels. I invite you to join my proudly provincial movement, which I call Yokelism. 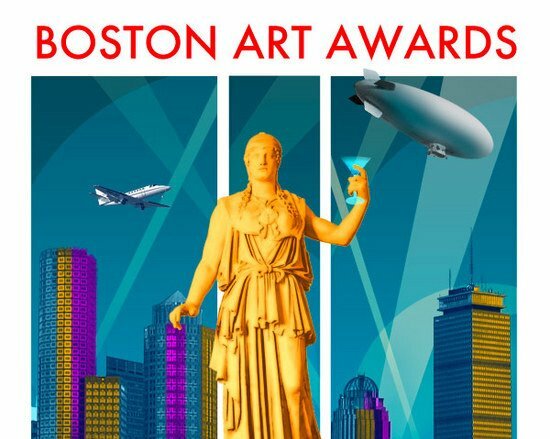 The Boston Art Awards are focused on exhibits organized here – and especially on art made here in New England. They are a sort of argument about what we value here. They look back to where we’ve been but also point to where we’d like to go. They identify the sort of ideas, the sort of spirit, the sort of crazy amazing stuff we’d like to see more of around here. 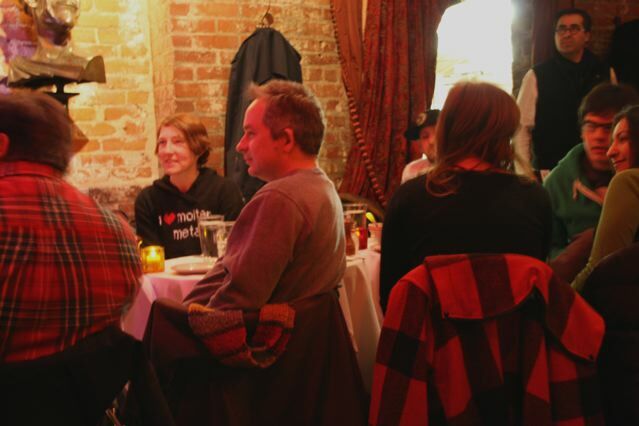 The Boston Art Awards are also meant to be the beginning of a discussion. A discussion I hope all of you will join me in here on The New England Journal of Aesthetic Research and in various forums over the coming months. A discussion about why art made here matters. And how can we better support the cool stuff that we do. And incubate more amazing stuff. And so produce more terrific stuff to make our art scene more exciting. And in turn make our New England community more thrilling and more nourishing for everyone who lives here. As we all know, 2008 was a tough year for the New England art scene. And 2009 isn’t looking sunnier. So during the awards I paused to acknowledge some of the local treasures that we lost this past year. A number of curators have moved on, including Rachel Rosenfield Lafo, Bill Arning, Cheryl Brutvan, Vesela Sretenovic, Carole Anne Meehan, and Daniel O’Leary. Ten Boston-area galleries closed: ArtSPACE@16, Judy Ann Goldman, Gallery XIV, Julie Chae, Rhys Gallery, MPG Contemporary, Pepper, Space Other, Bernard Toale and Allston Skirt. And, hey, when is Beth Urdang going to reopen? Out of the blue, the University of Rhode Island shuttered its Fine Art Center Galleries over the summer and laid off its intrepid director Judith Tolnick Champa. Pioneering holographer Harriet Casdin-Silver of Brookline died in March. Photographer Jules Aarons of Newton died in November. Painter Andrew Wyeth of Maine and Pennsylvania died in January. I’m hoping that somehow the trustees of Brandeis University will find a way to reverse themselves and save their Rose Art Museum from being on this list next year. Right? Let’s all help them change their minds. Also, as a member of the increasingly endangered press, at a moment when arts coverage is particularly threatened, let’s hope our art local art press is not on this list next year. Thank you for your support. 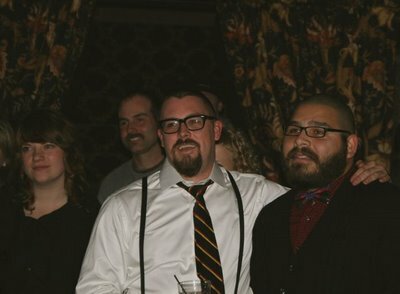 • The folks at Big Red and Shiny, including Matt Nash, Christian Holland and James Nadeau, who organized the party. I organized the awards, but they did the hard behind the scenes work to make last night’s celebration happen. And Matt designed the awesome poster. • The folks at the Beehive for their hospitality. 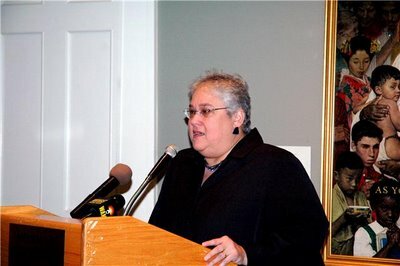 • Francine Koslow Miller, who ran the New England AICA awards – that’s a critics’ organization – for six years, concluding last February. As I was taking on this crazy, amazing project, she offered helpful suggestions. 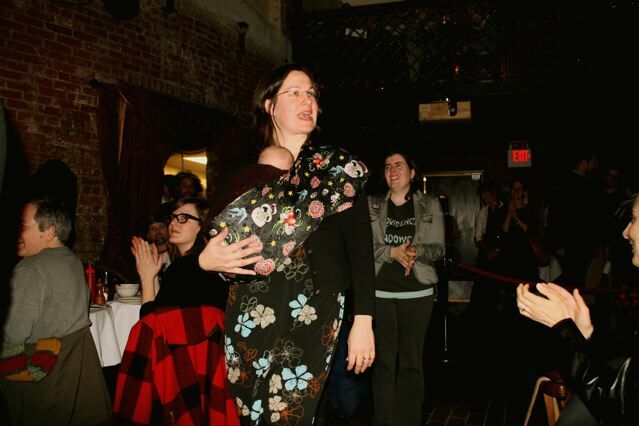 The Boston Art Awards builds upon the foundation she laid. • Jane Cunningham, who attended from Gloucester as The Journal’s very official photographer. Also James Manning for photographing for Big Red & Shiny. • The critics who voted: Edgar Allen Beem, Evan Garza, Shawn Hill, Christian Holland, Francine Koslow Miller, Shirley B. Moskow, Matt Nash, Doug Norris, and me. • All the people across New England who made nominations and who voted. More than 60 people made some 180 nominations. And some 600 people voted. The winners of the 2008 Boston Art Awards, which were organized by The New England Journal of Aesthetic Research, were announced at the Beehive in Boston tonight. More than 60 people made some 180 nominations, and some 600 people voted. Participating critics included: Edgar Allen Beem, Greg Cook, Evan Garza, Shawn Hill, Christian Holland, Francine Koslow Miller, Shirley B. Moskow, Matt Nash, and Doug Norris. Winners were awarded the certificate-trophy pictured above. • Andrew Witkin of Boston in ICA’s Foster Prize exhibit, November 2008 to March 2009. • Jacob Berendes, HBML Junk Shoppe, Worcester, forever. • Judy Haberl of Newtonville, MA, Gallery Kayafas, March to April. • Jess T. Dugan of Cambridge, Gallery Kayafas, September to October. • Raul Gonzalez of Somerville, “Chingasos,” New England Gallery of Latin American Art in East Boston, May. • Neal Walsh of Providence, 5 Traverse, April. • Mary O'Malley of Somerville in “Overflow,” Laconia, October to November. • Brian Chippendale of Providence, “Human Mold,” Stairwell, May to June. 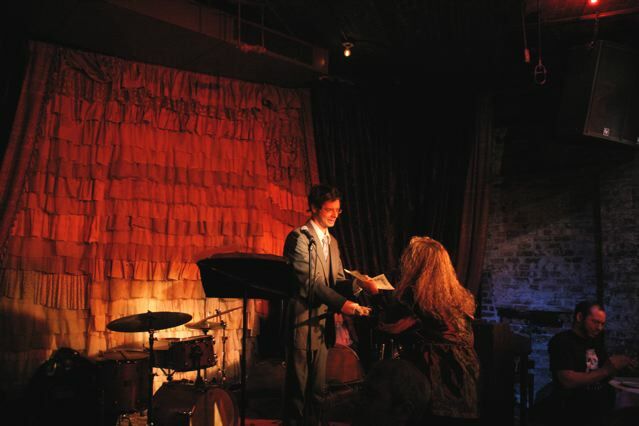 • Suara Welitoff of Cambridge, “Anonymous,” Allston Skirt, February to March. • Dirk Adams of Roslindale, "Mouth of a Story" at the empty bear cages at Franklin Park, Boston. • Catherine D'Ignazio of Waltham in the ICA’s Foster Prize exhibit, November 2008 to March 2009. • Dave Cole of Providence, “All American,” Rotenberg Gallery, September to October. • Xander Marro of Providence in “NetWorks 2008” at AS220, Newport Art Museum, 5 Traverse, October 2008 to January 2009. • Platform2 of Boston [Catherine D’Ignazio (aka Kanarinka) of Waltham, Savic Rasovic (aka Sasha and Pirun) of Cambridge, Andi Sutton of JP and Jane Marsching of Roslindale], “Parade for the Future,” Boston Common, September. • “Providence Art Windows,” exhibits in Providence storefronts, throughout the year. 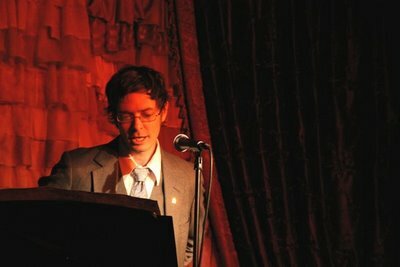 • Caleb Neelon of Cambridge, “Book of Awesome,” Ginko Press. • Jo Dery of Providence, “Quietly Sure - Like the Keeper of a Great Secret,” Little Otsu. • Corita Kent, late of Boston, ‘We Can Create Life Without War,” Breslin Fine Art, organized by Joanne Breslin, April to May. • “Harry Callahan: Eleanor” at RISD Museum, late Providence photographer, organized by Atlanta’s High Museum of Art, November 2008 to February 2009. • Ben Sloat of Jamaica Plain, street performance of “Thriller” as part of his exhibit “I’m Not Like the Other Guys” at OHT Gallery, September. 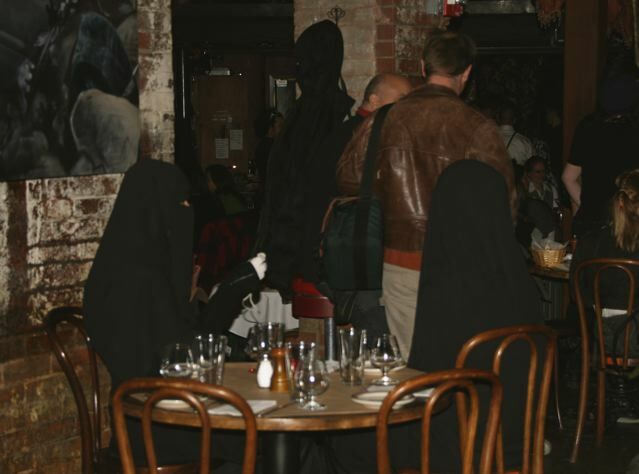 • Iron Guild of Boston and Maine for its 6th Annual Halloween Pour at the Steel Yard, Oct. 31. • Jess T. Dugan of Cambridge at Gallery Kayafas, September to October. • Tom Deininger of Newport, RI, in "Trash" at 5 Traverse, September to October. • Tara Donovan of Brooklyn, ICA, curated by the ICA’s Nicholas Baume and Jen Mergel, October 2008 to January 2009. • “To the Ends of the Earth,” Peabody Essex Museum, curated by PEM’s Samuel Scott, November 2008 to March 2009. • “Social Photography Across a Century: The Works of American Master Lewis Hine and Contemporary Artist Scott Lapham [of Providence],” Slater Mill Gallery, curated by Slater Mill’s Andrian Paquette, Pawtucket, April to June. • “In Pursuit of Beauty,” Montserrat College of Art, curated by Leonie Bradbury, November 2008 to January 2009. • “Drawn to Detail,” DeCordova Museum, organized by DeCordova’s Rachel Rosenfield Lafo, Kate Dempsey and Nina Bozicnik, August 2008 to January 2009. • “This is Boston, Not LA,” LaMontagne Gallery, curated by Emily Isenberg and Russell LaMontagne, November to December. • "Hecho a Mano: New Visions of Latin Contemporary Art,” Center for Latino Art, curated by Evan Garza, September to October. • Maggie Holtzberg, “Keepers of Tradition,” National Heritage Museum, May 2008 to June 2009. 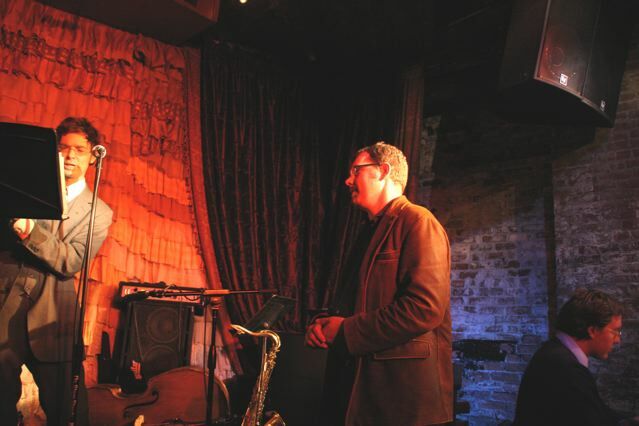 • Neal Walsh and Mike Taylor, "New Obstructions,” AS220’s Mercantile Block, September to October. • Leif Goldberg of Providence in “Sound Beings,” Stairwell Gallery, March to April. • John Bisbee of Brunswick, Maine, “Bright Common Spikes,” Portland Museum of Art, curated by Susan Danly, January to March. • Mike Taylor of Providence (now Florida) “Glitter Disco Synthesizer Nite School,” Stairwell, December. 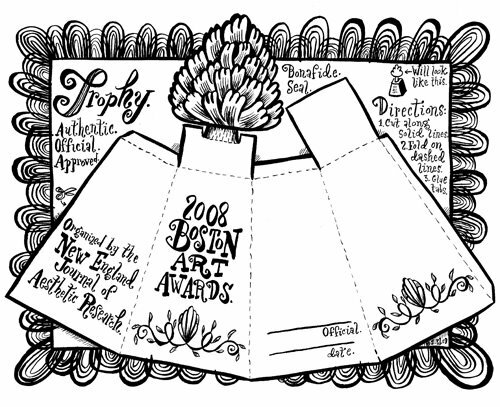 Tonight The New England Journal of Aesthetic Research announces the winners of its 2008 Boston Art Awards. The Art Awards Ball, which we’ve teamed up with Big Red and Shiny to present, begins at 6 p.m. at the Beehive at the Boston Center for the Arts, 541 Tremont St., Boston. Doors open at 5. The event is free and open to all. Creative evening attire is encouraged. So please join us for cocktails, toasts, and awkward speeches as we support art from New England. A long time ago (say 70 years), in a galaxy far, far away (New York), a tired band of rebels ached to be the Next Big Thing. These artists had their eyes on the hot stuff coming out of Paris — Cubism, Dada, Surrealism — while the Paris artists themselves were coming out of Paris, fleeing Hitler. With the European avant-garde taking refuge in the Big Apple, and democratic Europe fighting for its survival, the New York art gang kept right on painting. 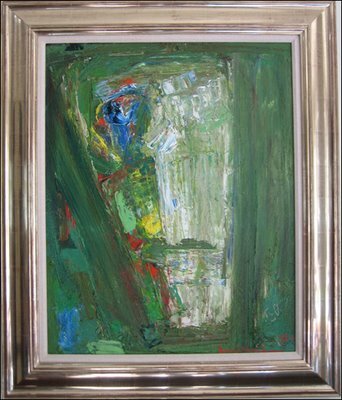 One of those European expats was Hans Hofmann, a German who had studied in Paris, hung out with Picasso and Matisse, and taken Picasso's Cubist compositions and Matisse's feel for color to heart. He came to the US to teach in 1930; Hitler's moves persuaded him to settle in New York two years later. There, and in Provincetown, he opened his own schools, where he taught a generation of artists that included Larry Rivers, Red Grooms, Joan Mitchell, Ray Eames, and Allan Kaprow. 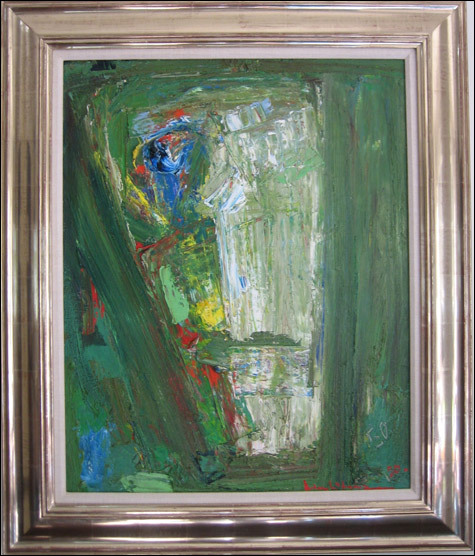 Hofmann became known as a thinker and a theorist of abstract painting. He explained how overlapping shapes and suggestions of shadows could create a dynamic "push-pull" tension between the flatness of the canvas and illusions of depth. He spoke of the emotional jolt colors could pack. He believed in improvisation. Via his teaching and writing and public speaking, his ideas went viral. They became central to the Next Big Thing, which came out of New York in the wake of World War II. It became known variously as Action Painting and Abstract Expressionism. The new stars — Jackson Pollock, Willem de Kooning, Mark Rothko, Franz Kline, Barnett Newman — were men in their late 30s and 40s who made big bold macho paintings with tangles of slashing lines or great fields of color. 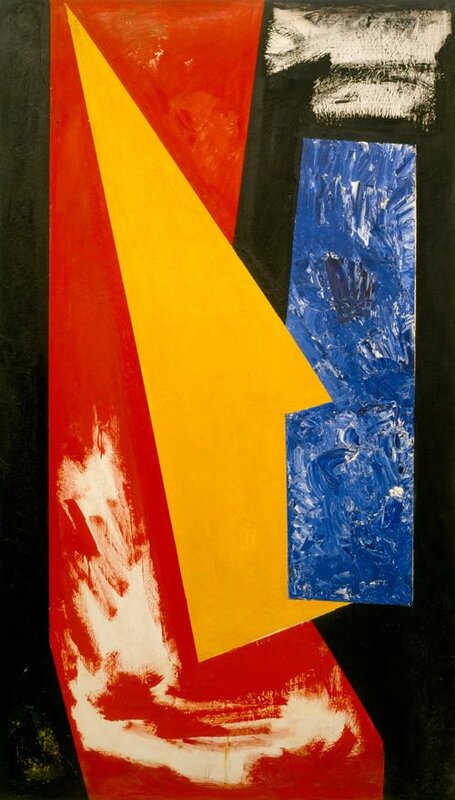 Hofmann, a generation older, kept painting, but his ideas, the theoretical underpinnings for many artists' experiments in abstraction, overshadowed his abstract canvases. 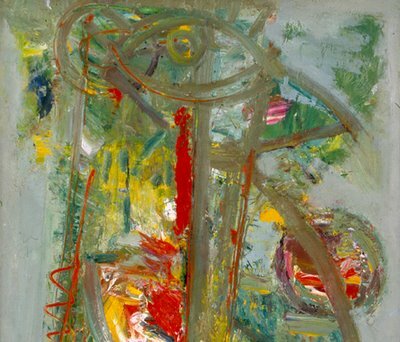 The sharp, scholarly exhibit "Hans Hofmann: Circa 1950" arrives at Brandeis's Rose Art Museum still mulling over whether his painting was as important as his thinking. Curators Michael Rush, the Rose's director, and Catherine Morris, an independent operator, say yes. “Hans Hofmann: Circa 1950,” Rose Art Museum, Brandeis University, 415 South St., Waltham, Jan. 15 to April 5, 2009. “Sketch for Chimbote Mural Fragment Pt. 1,” 1950; “Chimbote Mural,” (courtesy of the Renate, Hans and Maria Hofmann Trust); and “Image in Green,” 1950 (collectiom of Karen LaGatta and Marshall G. Allan).